Net Metering: A brilliant concept whose time has passed? There is no doubt that the practice of net metering for residential solar photovoltaic systems has been a key enabler of the rapid growth of rooftop solar generation in the United States (see OWOE: How does net metering encourage private investment in home solar systems?). But has it outlived it usefulness? Or, has it even become a barrier to greater renewable penetration into the marketplace? 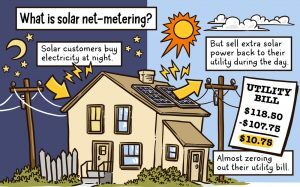 Net metering is the practice of allowing rooftop solar system owners to “sell” the excess electricity they’ve generated back to the utility at the same cost per kilowatt-hour as the electricity they purchase. The mechanics of the process are simple – the meter runs forward when the homeowner takes electricity from the grid, and the meter runs backward when the excess generation is pushed back to the grid. And, at the end of a fixed time period, typically a year, there is a reconciliation effort to make sure the total in vs. out matched, with any excess generation paid for at a reduced power price. This process was originally viewed as maximizing the value of the owner’s system, if it had been properly sized, and has encouraged many owners to purchase their systems. However, the utilities have argued that the process undervalues the benefit that the utility and grid are providing to serve essentially as a large battery. Most states that have net metering procedures in place have a limit on how much ‘behind-the-meter” capacity can be added to the gird. California, for example, initially had a maximum of 5% of total electricity demand from the three investor-owned utilities in the state: Pacific Gas & Electric (PG&E), San Diego Gas & Electric (SDG&E), and Southern California Edison (SCE). Toward the end of 2015, all three utilities were approaching that cap. To ensure that solar would continue to succeed, the California Public Utilities Commission (CPUC) created a next-generation program known as “Net Metering 2.0″. The revised rules required new customers to be enrolled in time-of-use (TOU) rates, which means that their electricity could be priced differently depending upon when it was used or returned to the grid, e.g., higher price during peak periods of demand. The new rules also included a one-time connection fee to the grid and a small monthly cost. Although neither party got exactly what it wanted under the new rules, it was an acceptable compromise that ensured that rooftop solar generation would continue to grow in California. Net Metering 2.0 will run through 2019, at which time the CPUC will revisit the program. 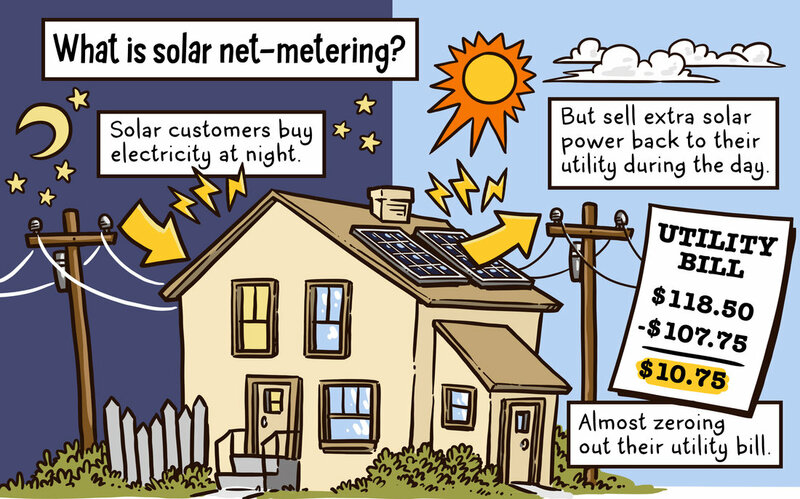 Customers set up under the original net metering rules were grandfathered for 20 years. But what about the future? If one steps back from the debate over net metering and looks at renewable energy generation in a holistic manner, one can see that in the long-term net metering will hold back penetration of renewable energy into the market. The problems caused by net metering are primarily that the rooftop solar system owner has no incentive to generate more electricity than he uses, and the utility has no incentive to utilize this capacity in its overall power generation and delivery strategy. It is not a benefit to the utility as much as it is a burden. Even California’s Net Metering 2.0 approach only creates partial incentives with its TOU rates since these are still retail rates. As an alternative to net metering, what if we imagined a system whereby a homeowner could install as large a system as he desired with as much onsite storage as he desired? This owner would now be a mini power plant operator with full control of how much electricity he provided to the gird and when. He could enter into an agreement with the power company to provide power when it was the most needed (and most valuable) and take power when it was the cheapest to use, for example for charging his electric vehicle (EV). His smart inverter would manage the electricity flow to maximize income and thereby maximize the value of his system. Such technology is already becoming available on the market (for example with SunRun’s BrightBox product). With thousands of such customers the utility will have the equivalent of a utility-scale power plant to supplement its more traditional plants. The utility could incorporate this available power source into its short and long-term dispatch planning. This additional and flexible capacity could minimize the need to build new capacity into the system to handle the intermittency of solar and wind generated power. It could also minimize the amount of fossil fuel powered plants needed for standby generation. So…net metering is good, but more modern approaches that maximize the benefits of latest technology are even better.